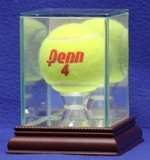 Single tennis ball acrylic display case with a wood platform base with marble finish. Features a custom ball holder and mirrored floor so you can see the entire ball. Now display your tennis ball like never before, in the absolutely incredible floating case. the ball sits in. Overall dimensions are 3-1/2 x 3-1/2 x 3/4. Comes with 1 free name plate. Due to the size of the engraving area, please limit characters to 40 per line and 3 lines. in stand to hold the ball properly in place. It's 2 piece construction makes it easy to use. a full master case pack and save on shipping. sized to hold a tennis ball. Includes 1 free nameplate. NEW RE-SIZED BASE HOLDS A LARGER PLATE WITH MORE TEXT. hand finished in your choice of cherry, golden oak or traditional walnut stain. the shape of the acrylic cover. Price includes 1 free nameplate. Single tennis ball acrylic display case with black base. Price includes 1 free nameplate. If no nameplate is wanted, simply leave that field blank. Double (2) tennis ball acrylic display case with black base. Price includes up to 2 free nameplates. If no nameplate is wanted, simply leave that field blank. 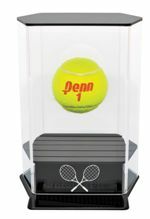 Triple (3) tennis ball acrylic display case with black base. Price includes up to3 free nameplates. If no nameplate is wanted, simply leave that field blank. 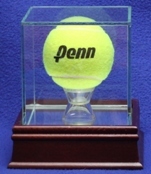 Acrylic display case with custom stand for 1 standard tennis ball. This display case has angled edges for a different look. 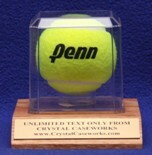 Acrylic single tennis ball display case with beveled edges and cherry wood base. Also includes a mirrored floor so you can see the entire ball. It's beveled edges are a nice change from the standard square cases. Brass display stand designed to hold a single tennis. The ball sits on stands shaped like mini tennis racquets. Also available for a baseball or golf ball.